It’s that wonderful time of year again, time to write my Santa letter! I’m a bit later than last year because I couldn’t find my special glitter pens and also because I had to wait to see all the toy catalogues before I could decide. In the end I just decided I want a lot of James Bond’s stuff. Here I am writing my letter. Mummy said I couldn’t ask for more than five things so I had to leave the fire breathing dragon and Castle Oink for next year. I drew a map for Santa just in case he couldn’t find our house and I even drew a diagram of the house to show where the chimney is. Ted wrote a letter too but his is quite boring. He just asked for sweets and a teddy and then offered Santa some cookies and carrots for Rudolph. I hate carrots (yucky vegetables) so I’m quite pleased that they’re going to the reindeer. Now if only I could persuade Mummy to give the Brussels sprouts to them too…. 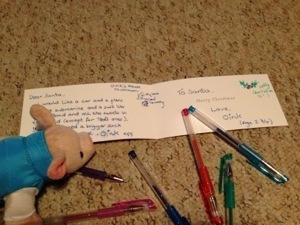 Once our letters were written, we put them into our Santa socks for him to collect tonight. I was going to set up a net under the chimney to try to catch him but he won’t have his present sack with him yet. And apparently that is ‘bold’ behaviour and might mean I get no presents at all! Being good is so difficult!!! 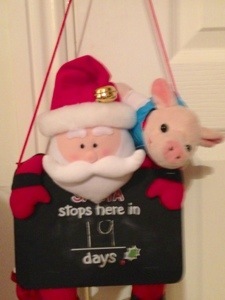 Finally, Daddy went to the attic earlier to get my Santa countdown for me. I change the number on it every day with my chalk. Next time nobody is looking I’m going to skip a few numbers so that Santa comes sooner! 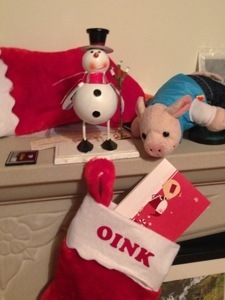 This entry was posted in Uncategorized and tagged Santa letter. Bookmark the permalink.